I'm well aware that nobody is going to believe me that the Cap'n willingly sat down to watch a new Keanu Reeves joint. After all, I'm one of those Day One Matrix deniers who still doesn't get why everybody is so gaga about the first movie. Technically proficient, fun to watch action movie with pretensions of being high-minded science fiction? Sure, and most certainly to the second part, because if you name-drop Baudrillard in your movie and then he says you missed the point of Simulacra and Simulation... yeah. You know kung-fu. I still laugh when I think about that. Also, it's Dark City a year after Dark City came out. But I'm not here to re-litigate arguments from fifteen years ago. The point is that while I've seen many Keanu Reeves movies (including The Replacements), it's always with a groan or rolled eyes. The Cap'n has always been kind of a jerk when it came to Ted Theodore Logan, especially in his "action" phase. But yeah, John Wick. The trailer looked great, and I already enjoyed Man of Tai Chi (directed by and starring Reeves as the bad guy), so what the hell? A good, straight ahead revenge movie usually scratches my itch, and John Wick had a pretty solid premise: a retired hitman (Reeves) loses his wife, his car, and his dog in the span of a few days. The last two happen in one fell swoop, thanks to some Russian mobster (Michael Nyqvist)'s idiot kid (Alfie Allen), who just decides to break in to Wick's house because he wouldn't sell him his 1970 Mustang. Everybody, including his father, is immediately aware that this was a bad, bad idea, because John Wick is something of a legend among hit men. There's a stripped down quality to John Wick, directed by longtime Reeves stunt double Chad Stahelski that's refreshing in a way. I don't need every action movie to reinvent the wheel or throw in some crazy gimmick; as much as I find the Fast and Furious sequels entertaining, the ludicrous need to top themselves is funnier than it is exciting. John Wick reminds me a little bit of Payback in tone, but with more aggressive, brutal fights. Stahelski resists the current urge to edit every fight scene to the point of incomprehensibility, and we, the audience, are rewarded with long takes where Reeves mixes in a combination of kung-fu, gun-fu, with a touch of MMA-based grappling thrown in when he doesn't have an option. John Wick is not a man with whom you should mess, and everybody in the film except for Iosef (Allen) seems to understand that. After the idiot steals the car, he takes it to a chop shop and is promptly punched in the face by Aurelio (John Leguizamo) for having the audacity to bring John Wick's car to him. He asks him "do you know whose car this is?" and Iosef looks at him like he's insane. When Viggo (Nyqvist) calls later to ask Aurelio why he struck his son, his response to the explanation is "Oh," and he hangs up. Viggo knows his son is dead meat, and with a sense of resignation, he goes through the motion of trying to protect him: he calls Wick (it doesn't go well), he has his assistant, Avi (Dean Winters) put a contract on Wick's head, and he puts the boy in a safe house. But he knows how this is going to end. He even tries to explain it to his clueless son how dead he is, providing as much exposition about Wick's pre-retirement life as we're going to get juxtaposed with Reeves smashing open the floor. That's where the weapons and gold are - he'll need both to find Iosef, and he will find him. From there on out, John Wick the movie is a singular quest for revenge, and to facilitate that Stahleski and screenwriter Derek Kolstad (The Package) give us a glimpse into the underground world of assassins, without ever shifting or muddying the narrative. This gives them the opportunity to include a lot of recognizable actors from actions films (and elsewhere) to have a moment or two to shine in the film. Wick goes to The Continental Hotel, a place where hired killers can stay without fear of being attacked, thanks to house rules. It's run by Winston (Ian McShane, Death Race), who's surprised to see John walk back into his downstairs club. Adrianne Palicki (G.I. Joe: Retaliation) plays Jenkins, who's willing to violate the rules of the Continental in order to double the bounty on Wick's head. Willem Dafoe is Marcus, a mentor of Wick's who may or may not take Viggo up on the bounty. The Wire's John Reddick and Clarke Peters play the concierge at the Continental and Harry, an associate of John's who agrees to watch Jenkins. You might also notice Kevin Nash (The Punisher), Keith Jardine (Gamer), Randal Duk Kim (The Matrix Reloaded), Daniel Bernhardt (Bloodsport 2), and Bridget Moynahan (I, Robot) briefly appearing as his dying wife. My favorite cameo is actually the leader of the cleanup crew that Wick calls, played by David Patrick Kelley (Commando). After a botched hit on his house, Wick calls out for a "reservation for twelve," which brings Charlie (Kelley) and two three burly guys in a "cleaning" van who meticulously clean the place up. It follows a scene where a Jimmy (The Newsroom's Thomas Sadoski), a local cop, responds to noise complaints at the Wick residence and finds John, post-neck snapping. Even Jimmy knows not to ask too much, so he nervously says, "you working again?" and then leaves Wick to his business. It's Reeves show, however, and he carries the film with a stoic, reserved performance, punctuated only by outbursts of brutal, focused violence. It's not often when you can make a headshot feel that rough, but Stahleski and Reeves work hard to make every blow register, every shot hurt. And Wick doesn't go unscathed - as good as he is, there's a little ring rust, and small mistakes add up over the course of the film. Of course, that leads to one of the best parts of the final fight between Reeves and Nyqvist, involving a knife, an abdominal wound, and a broken arm. There's really not much in Reeves' performance that's reminiscent of the wooden line readings I used to dread, and even when he does open up emotionally, it's with a seething rage that's more menacing than comical. 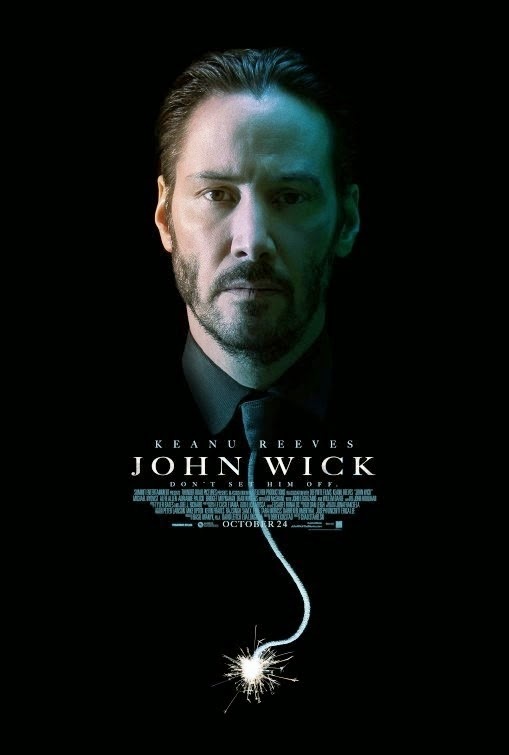 Despite being emotionally devastated not once, but twice, Reeves bottles most of that up and give John Wick a steeled determination. His biggest laugh in the film is actually intended to be a joke, but his deadpan reaction to the joke is arguably funnier (it's in the trailer - the laundry scene), but it's supposed to be. Nyqvist and Allen are both good, the former more so than the latter, but mostly because Iosef is such a one note character. Despite having to be a Russian for no apparent reason (they're good villains, I guess) the Swedish Nyqvist brings a lot of nuance to a character that could have easily ended up like Rade Serbedzija's in Taken 2. He knows he can't be John Wick, and even in his small moments of hubris, where Viggo thinks he has an edge, there's a lingering doubt. Wick helped build his criminal empire, by doing the "impossible" hit, and he's not a man to try and stop. They have the mandatory final fight - hand to hand, in the rain - but it doesn't feel perfunctory. It's just the only way this can end. For me, John Wick feels like the culmination of a new era for Keanu Reeves, one where he's stepped back from doing big, blockbuster Hollywood movies in order to focus on projects he's passionate about. I had originally thought he stepped back after the third Matrix movie, but a glance at IMDB reminded me of Constantine and The Day the Earth Stood Still. One of those I liked and one I really didn't. Take a guess. I guess Street Kings would fall under that umbrella, too, but I think of that more as a first step for David Ayer that made it all the way to Fury this year (more on Fury another time). What I'd mostly remembered from Reeves was roles in smaller films that I liked a lot more, like Thumbsucker or A Scanner Darkly. That seemed to me more like the guy who took a supporting role in My Own Private Idaho than the star of Speed or Point Break. He narrated and conducted most of the interviews in Side by Side, and then spent a few years trying to make 47 Ronin happen (still haven't seen that one, but didn't hear great things), and the aforementioned Man of Tai Chi, which is less bombastic and more focused on good action choreography. And good action choreography is getting harder to find these days - just watch an Expendables movie if you doubt that. Maybe culmination is the wrong word - it's more like the "coming out" party for a new era of Reeves, the badass action star, not the one we underestimated because of his predilection for air guitar a long time ago (and, maybe, again). I don't always expect or even need action movies to be totally innovative or cutting edge. If you can tell a simple story very well, then that's just as welcome - sometimes even more so. John Wick is a very, very good revenge film, one that doesn't try crazy tricks or editing chicanery. If you're looking for a low-frills, quip-free, meat and potatoes action movie, this is right up your alley. In fact, I find it kind of amusing that most of the negative reviews of John Wick (which there aren't a lot of that I saw) use the fact that it's not somehow "groundbreaking" or "game changing" enough as the reason for it not being good. Oh well, if that's the worst you can say, I think John Wick's going to be okay. It gives you a glimpse into a world you wouldn't mind revisiting, with characters that would be interesting to see again. Some of them live, some of them don't, but since John Wick is wholly invented, I wouldn't say no to more films that took place before or after this one. Or, if it's a one-off, like Steven Soderbergh's Haywire, so be it. But I wouldn't say no to more movies with Mallory Kane or John Wick. And if you told me ten years ago that I would welcome more action movies from Steven Soderbergh or with Keanu Reeves, I might have called you crazy. Thankfully, the Cap'n is wrong sometimes. So put aside your inner doubts and see John Wick. It's much better than you're giving it credit for, sight unseen.